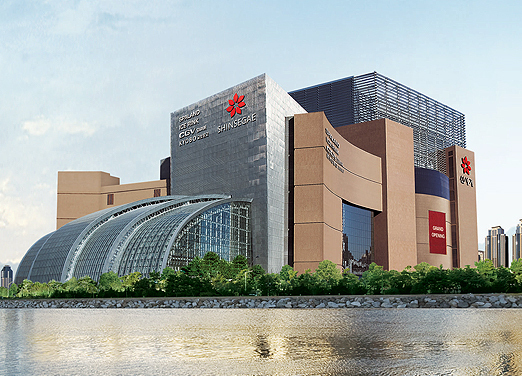 Just because something is the largest does not always necessarily make it the chicest, except perhaps in the case of Shinsegae Centum City. Guinness-certified as the largest department store in the world, this retail behemoth measures in at fourteen stories and 3.1 million square feet. Koreans love their luxury labels, and the Centum City does not disappoint–Gucci, Chanel or Hermes anyone? In the past, I wouldn’t have batted an eyelash before whipping out the plastic to splurge on a pair of shoes or a posh handbag, but these days, I travel so much that I try to keep my possessions to a minimum. Not to worry, you don’t have to be a clotheshorse to get a kick out of this consumer wonderland. The Water Bar – It may sound strange, but I am a water connoisseur. Despite the doubts of others, I can taste the subtle differences among different brands of water, and I do indeed have my favorite…sorry Evian, it’s not you. 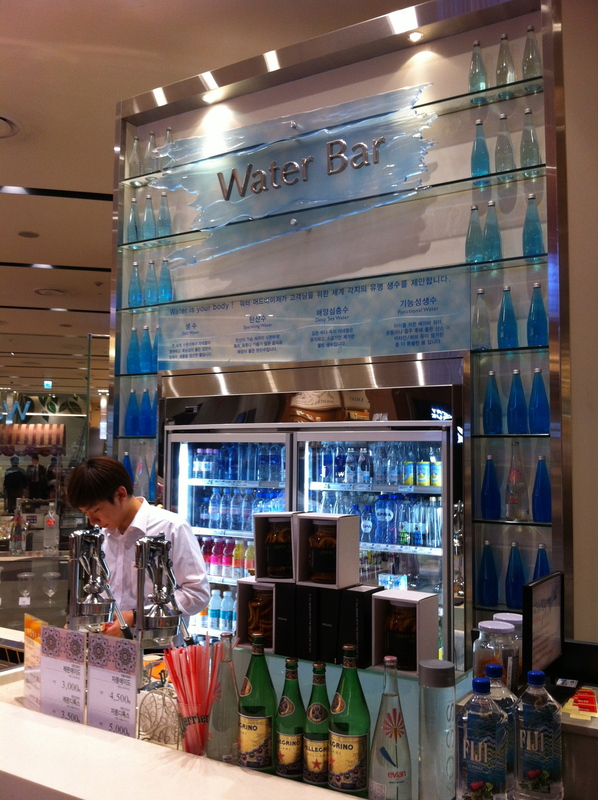 To my surprise and delight I stumbled upon a water bar in the basement food court of Shinsegae. Not only did it stock the usual still, sparkling and flavored, but a huge inventory of international water brands I hadn’t seen elsewhere in Korea, like Fiji, Voss and my favorite, Smartwater. While it’s not necessarily cheap (most bottles are between $3-$5), it’s a heck of a lot cheaper than anything you’ll find in the Prada boutique upstairs. 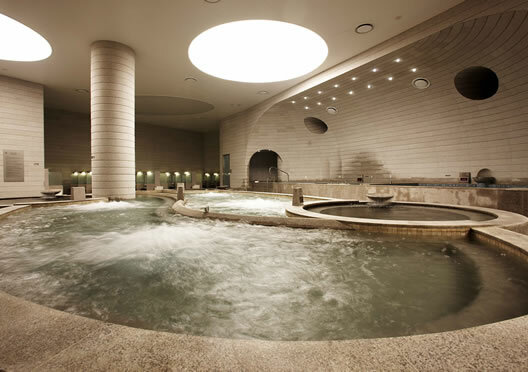 Spaland – For just 12,000 won (about $12), one can feel like royalty in this ultra modern and luxurious spa. As far as jimjilbangs go, there are many with a more authentic Korean experience, but Spaland is meant to impress. Decked out in opulent glass and marble with high ceilings and natural light, the wide open space in filled with pools of different temperatures and water types (natural spring, salt, etc.) that loudly beckon to weary muscles. My favorite was the outdoor hot springs and the quintessentially Korean foot massage rock path. Shinsegae Centum City may have won the prize for being the largest, but in my eyes it is all about being the chicest. Any other votes for chicest department store?